an up to date networking environment to support all students and staff for their learning, research, teaching, and administration. The institute facilitates services like advanced network facilities, Internet security system, anti-virus software, Network services supporting to the Distribution switch level, ADSL Modems, and Wi-Fi services. Implementation of LAN/wired network of the Computing Services Centre has enabled the staff and students to connect easily within campus to the campus network in a wireless manner. With this, college blocks, laboratories, seminar halls and selected places in departments have excellent Wi-Fi connection quality at a speed of up to 10-15 Mbps. To protect the network and data from the potential attack institute has quick heal and NPAV internet security antivirus system upgraded in 2018 for 1 year. The Security System runs 24-hours non-stop and provide network services to support the IT needs of the Institution. Software and hardware are upgraded periodically as when a demand for the same arrives. The present age is dependent on IT, ICT, Computer, Internet and Wi-Fi. All the techniques are directly or indirectly related with computer system. Keeping these changes in mind, the college has started new courses like B.Sc. (Computer Science), B.Com. (Computer Application), BCA, M.Sc. 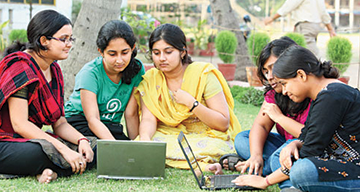 (Computer Science), DCA, PGDCA, Add-on courses in 4 subjects, PG Diploma in Tally. The institution also provides computer with internet facility to all the departments through Wi-Fi and LAN. Chips Wi-Fi and Jio Wi-Fi are also available in the campus with 10 Mbps broadband connectivity. There are two computer labs, one english language lab for e-resources with 185 computer systems in all available in the institution. Our students and Faculty members are using Educational websites like, Khan Academy, edx, coursezra, phet, wolfrom alpha, npt EL, and Swayam, Saksham. All the computers are connected with LAN 10/100/1000 Mbps internet connectivity from broadband connection of BSNL.